The Tour du Mont Blanc trail takes you through spectacular scenery of snow-capped mountains and glacial valleys in the French, Italian and Swiss Alps. Typically, the classic trekking tour of the Tour du Mont Blanc is walked in an anti-clockwise route that takes about 8-11 days. Some people do it faster by either missing sections out and taking public transport or walking faster! The Ultra Trail Mont Blanc (UTMB) is the annual mountain marathon that follows the anti-clockwise route. The winner tends to cover the complete TMB in under 20 hours, but the majority of competitors complete it in 30-40 hours. The race takes place every year over the last weekend of August and attracts up to 5000 competitors. People hiking the TMB at this time of year can enjoy the spectacle of all the runners and the best way to take it all in is to walk clockwise. Those that hike the TMB in 8-11 days can choose to go along or with a Guide. Salamander Adventures team of International Mountain Leaders (IML) are experienced and offer a full-service trek for those who prefer to be guided. 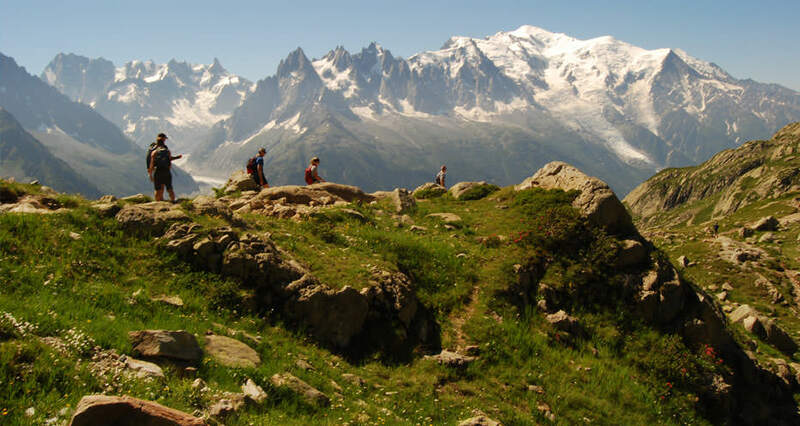 You can see the options here: Guided Tour du Mont Blanc and Self Guided Tour du Mont Blanc. From France, the Tour du Mont Blanc trail, which is about 165km, usually starts and finishes in Les Houches in the Chamonix valley or Courmayeur if you chose to begin on the Italian side. In Switzerland, the starting and end point is either Champex or a point close to Martigny. The Grand Col Ferret, marking the boundary between Italy and Switzerland, is 2532m and the highest points on the classic Tour du Mont Blanc trail. There are other higher passes if you choose to hike on some of the TMB variants. These include the Fenêtre d’Arpette in Switzerland at 2665m. The altitude, at any time of the trek, is not high enough to cause sickness for most people. The Italian side of the Tour du Mont Blanc trail has arguably the most spectacular scenery on the whole trek. The mountains are much steeper and the valleys feel more rugged and remote. There is also the added bonus of great food and coffee! On the Italian side of the Grand Col Ferret you can find home-made ice cream made from cows’ milk on farm where you buy it. We also spend two nights in Courmayeur so there is plenty of opportunity to stock up on pizza, pasta and your favourite pastries. To find out more or to book the Tour du Mont Blanc Trail get in touch with us today.